How to Prevent Trees from Damaging the Sidewalk | Mr. Tree, Inc.
Start by planting the tree right from the beginning! If you have the luxury of planning your home’s landscaping, you can begin with positioning your trees in the right place. Trees that cause sidewalks to buckle are often planted in the wrong place and stretching out in search of vital nutrients. Mr. Tree is a partner of Portland’s Friends of Trees, a non-profit organization dedicated to greening the Portland-Vancouver and Eugene-Springfield areas through tree planting events delivered by community volunteers. They and your Portland tree service would agree that the size, type, and location of your planting will have a great impact on the probability of tree roots not lifting nearby sidewalks. You should take into consideration placement of overhead and underground utility lines, street signs, signage and driveways when preparing the planting of a new tree. SFGate.com cites that in a 2011 survey by the University of Michigan Extension, tree root damage to sidewalks costs an average of $3 per tree per year to repair, and sewer damage costs $1.66 per tree more. The optimal tree to plant on the edge of a property line to prevent trees from damaging the sidewalk is slow-growing trees. For all trees, roots will grow in search of water. Tree roots, not only a tree’s anchor but also its delivery system for bringing water and nutrients into its hole, extend about one to one-and-a-half feet out from the trunk for every inch of trunk diameter measured; about four feet above the ground. So, a tree measuring 12 inches around in diameter will have roots stretching 12 to 15 feet out in every direction! Picture trees in a forest at varying heights and widths, and imagine the crossover and stretch of their roots! Now, picture your block and the potential impact on your sidewalk. These roots are searching for water. Not that you want to stifle growth, but, you can water longer and less frequently, soaking deeper into the soil rather than just on the surface layer. In the first few years of a tree’s growth, you’ll want to deep-root water to promote growth and good health. Slower watering helps to ensure the water goes deeper to the root source. Once a tree is roughly two to three years old, while continuing good watering practices, you would also begin pruning the tree. Cutting back branches that aren’t thriving, or that will start growing into the street, is a necessary practice. You can train the tree, to some degree, to divert it’s growth path. It may be required to obtain a street tree pruning permit from the city. Be sure to contact your Portland tree service or review the city’s website for guidance. Often with trees planted along the sidewalk, there will be the necessity to cut the roots surrounding sidewalk replacement and other street improvement projects. Some tree varieties that are more tolerant of root damage are the Norway maple, ginkgo, hackberry, hawthorns, cherries and river birch. Your Portland tree service can recommend the ideal tree to complement your landscaping and best thrive in your local environment, the potential impact of power lines, etc. 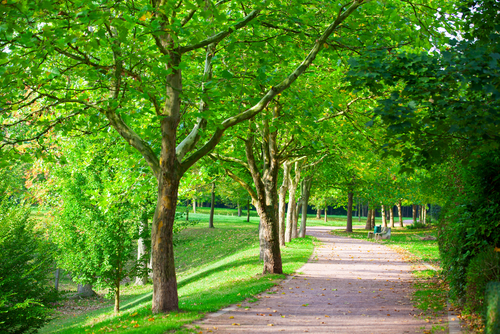 Trees that grow more slowly are also potentially less harmful to sidewalks.Your Portland tree service can recommend a range of trees that will grow more slowly and provide for a beautiful aesthetic. While a number of these trees are known to grow taller, we will take into consideration the width of your sidewalk, distance to the street, power lines and home in order to make the key recommendation. As having to remove trees defeats the purpose of careful planning in planting a tree, and may need to be in compliance with local ordinances, it’s important to take all possible precautions up front. This is often necessary when roots are too large to be cut and are now pushing up the original sidewalk. Another interpretation is more literal, where you actually would build a bridge sidewalk over the protruding tree roots. Landscape pavers may also be used in these circumstances. Even if a different material, these bricks can be adjusted to help settle roots back down as they expand without causing damage or the need for work to the entire sidewalk. There are some other ways that concrete can be beneficial in preventing sidewalk damage by your trees. Gravel can be placed beneath the sidewalk slab allowing for air spaces between the soil and the sidewalk for roots to grow without pushing up the slab. This isn’t a foolproof method, but studies have found great success with this methodology. Similarly, pouring a thicker slab of concrete may also prevent the roots from breaking through the slab. A standard thickness is 4 inches, but increasing the depth to 6 inches may be a solution. Should the roots start to lift the sidewalk, it will allow for shaving down of the sidewalk to level the surface back down. While the tree may again start to push up the slab, it should buy some much-needed time multiple times and allow for pruning. Also, using concrete reinforced with rebar or wire mesh will make the sidewalk stronger, especially when slabs connect together. This way they will adjoin to resist against roots trying to push up the slab. Additional efforts to prevent sidewalk damage by trees may include editing the design to allow for deeper root spread, or planting with alternative soils such and mulches. But with careful planning by your Portland tree service, you can select a tree that is best to thrive and enhance your property with a lesser risk of sidewalk damage.